The gradual separation of a child from the unity of the universe around her comes to completion in third grade. At some point during this two year cycle, children will enter a developmental phase referred to in child development as the “nine year change.” With an emergent sense of separateness comes self-awareness and recognition of being different from others. The reassuring order and harmony of the world that they previously relied upon is now questionable, including the authority of the important adults in their lives. Thematic lessons begin with an exploration of the practical aspects of life on earth: the cultivation of food, the building of shelters, and the creation of garments. 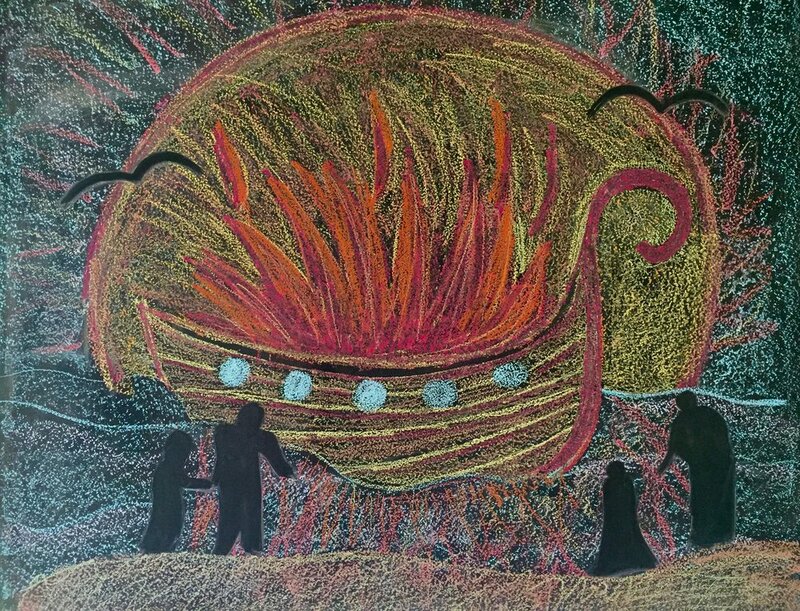 Norse myths depict the creation of the world out of fire and ice, and students enjoy the grandeur of characters that inhabit this world: gods and giants, dwarfs and humans. They see Loki, Thor and others march unmistakably, step by step, toward their doom. As one world is destroyed, another reassuringly emerges. Self confidence is reborn through the mastery of practical challenges and more complex conceptual learning. Grades 3-4 mathematics studies serve practical needs with the study of measurements (time and distance) and money, while continuing practice in the four operations on ever-larger numbers. Students are then introduced to fractions, where everything is split into ever-smaller pieces. Science studies become more focused and objective, with studies of the animal kingdom, and observation of animal forms and attributes as they view them in relation to human form and function. They will choose a particular animal to study as part of a first research project. Practical work and an interest in life on earth provide them with new focus, another way to feel connected to an orderly world. Mythologies illustrate the dissolution and disorder they may feel, while demonstrating that the cycles of civilization and life on Earth are a continuum, and the Earth and her living community are always reborn anew. Students experience themselves as 'new humans' that are learning to fully inhabit a dawning world. Language arts, arithmetic, science, history, geography, and mythology are interwoven through the thematic lesson. Mathematics may also be presented in a more focused, 30-40 minute 'extra lesson' period.